Beau Ridge, Holmdel Homes For Sale. Call 732-598-7700 to see the Homes For Sale Beau Ridge Holmdel. Beau Ridge Holmdel is a unique townhouse community in Holmdel, NJ. These upscale homes are, indeed, beautifully appointed single family residences. Located in an upscale community in Holmdel, the homes are adjacent to, but detached from one another. The homeowner is responsible for all maintenance, that is, both- inside and out. However, there is an association, and along with that there is a monthly fee. The monthly fee includes lawn care and snow removal. Also, use of the clubhouse, pool, gym, tennis and more. The homes in Beau Ridge Holmdel are multi-level, with typically 4 bedrooms. The homes share a large common driveway usually with three other homes. There are three models of homes in Beau Ridge Holmdel. The homes originally came with 2 or 3 bedrooms, with a basement that can be finished with many configurations. In fact, some homes have as many as 5 bedrooms. A two car garage is standard. There are 250 homes in Beau Ridge. 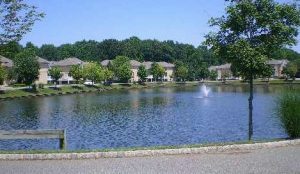 Located west of Route 35, this community is also near the Garden State Parkway (Exit 114). Commuters will love living here because of the location. Bus service is available for commuters to New York. Train stations for New Jersey Transit’s North Jersey Coast line are nearby in Middletown or Hazlet. In addition, the SeaStreak Ferry is within a short drive. Dining and shopping are abundant, also, two major malls are within a 30 minute drive of Beau Ridge. And don’t forget of course – the Jersey Shore. Many people move to Holmdel for the excellent, top-rated schools. Holmdel students will attend the Holmdel Township Public Schools. Village Elementary School serves grades K-3, Indian Hill School has grades 4-6, and William R Satz School serves grades 7-8. When students enter high school they will attend Holmdel High School. In fact, this school was recently ranked as the 11th-ranked public high school in New Jersey. Nationally it was ranked as Number 426. There are also excellent private schools in Holmdel. They are St Benedict (K-8) and St John Vianney High School. Other private schools in the area are Ranney School in Tinton Falls, a K-12 preparatory school and Christian Brothers Academy in Middletown. Call 732-598-7700 to see homes for sale Beau Ridge Holmdel.